UCLA | Paul's Voyage of Discovery & Etc. Eva B in Concert at UCLA! My daughter Eva B. Ross will play a free concert at UCLA’s Schoenberg Hall on Thursday, May 3 at 8:00 PM. Opening for Eva on this impressive, eclectic bill are the acclaimed Thelonious Monk Institute of Jazz Ensemble and Superdevoiche, the UCLA Balkan Women’s Choir. All that great music – and it’s free! Seating is limited. So RSVP here. RSVPs are priority up until 15 minutes before the show. Standby is on a first come, first seated basis. Early arrival is recommended. Ross is an up-and-coming singer-songwriter who grew up in Los Angeles performing in her family’s garage band. As a freshman at UCLA, she formed her band, Eva B. Ross Foundation, and independently set out on a European tour in the summer of 2014. In 2015, she released her first independent single “Nick’s House” and in 2017, she won UCLA’s Spring Sing at Pauley Pavilion with her original composition, “Chicago.” She is currently working on her debut EP, which will be co-produced by Grammy-winning producer Justin Niebank and Emmy-winning producer, Steve Rashid. Schoenberg Hall is located at Charles E Young Drive East 445, Los Angeles, California. Parking for Schoenberg Hall is in UCLA Parking Structure 2. Find maps and parking rates here. Eva Returns to The Hotel Café! If you missed Eva B. Ross the last time she played The Hotel Café – and especially if you were there – you won’t want to miss the Eva B. Ross Foundation when she returns to that cool & cozy venue on Friday, November 18 at 8:30 PM. The Hotel Café is located at 1623 N Cahuenga Blvd, Los Angeles, California 90028. 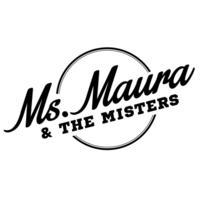 Eva will joined onstage by her fabulous guitarist David Miller – and she’ll be followed on the bill by a trio of talented fellow UCLA musical acts: Ryan Nealon Band, Mr. Moon and Apollo Soul. Tickets are $10 and make sure to say which band you’re coming to see at the door! Go to the Facebook event link here. If you haven’t seen my singer-songwriter daughter Eva in performance yet – this is the gig to see. I don’t know much about the music scene in Los Angeles, but I understand that it’s a big deal to play The Hotel Café. It’s evidently one of the cools gigs to get. And Eva’s got it. Eva’s very talented UCLA friend, Nick Valentini, is also on the bill with his eclectic and tasty band. I’ve seen Nick and his crew perform – and they’re brilliant! It’s going to be a legendary night of great music. So, be there. Victoria and I will be — and we hope to see you all there. For tickets, click on this link. Our musical daughter Eva will be playing with her tight and terrific band, the Eva B. Ross Foundation, on Saturday, April 4th at a club called TRiP in Santa Monica. This is going to be a very special event. There will be a wealth of great music: rock, jazz, blues and folk. Originals and classics. Besides Eva and her soulful, talented trio (David Miller on guitar, Jules Levy on standup bass and Liam Kevany on drums), the bill will also feature two great up and coming local bands, Loop Garou and We The Folk. TRiP Santa Monica is located at 2101 Lincoln Blvd. Tickets are $8 at the door. Celebrate the arrival of Spring with music, song and dancing! The very best thing about the first weekend of March Madness is that so many of the all-too-hyped freshman “one-and-done” NBA prospects were bounced from the NCAA Tournament. Schools with squads laden with upper classmen earned upset victories over programs that rely on rented hoop mercenaries, whose only interest in college is as a one-season showcase for their talents. When Mercer beat Duke and Stanford knocked out Kansas, maturity and team play proved superior to the ballyhooed skills of freshmen like Jabari Parker, who made only 4 of his 16 shots and was 0-3 from 3-pt range against Mercer — and Andrew Wiggins, who managed just 4 points on 1 of 6 shooting against Stanford. 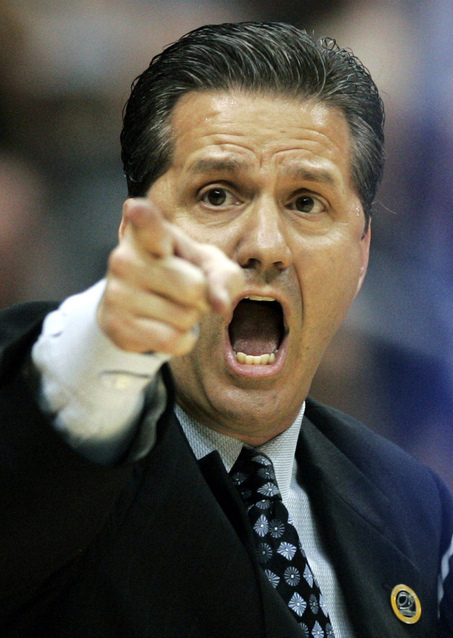 If only Wichita State had been able to close out Kentucky — whose coach, John Calipari, has embraced the “one and done” phenomenon. In recent years, Calipari hasn’t so much recruited as reloaded, stocking up on NBA-bound prospects for short-term success. 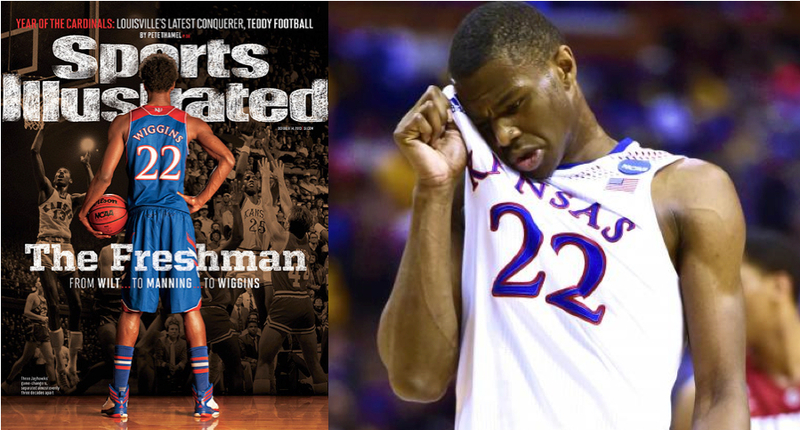 He started 5 freshmen against Wichita State. Wichita State, led by senior Cleanthony Early’s 31 points, fell just 2 points shy of sending Kentucky home short of the Sweet-16. Still, March Madness has already taken some of the overheated air out of the puffed-up one-and-dones. 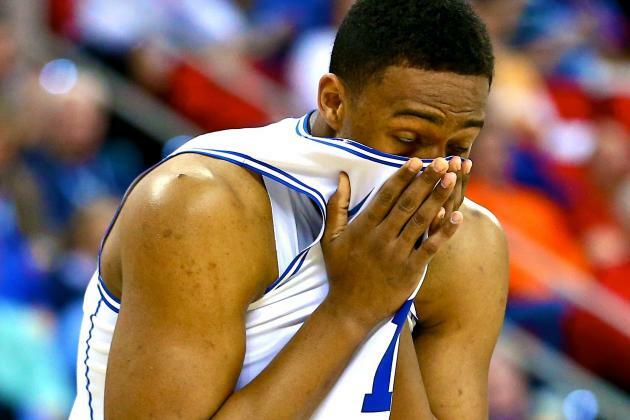 In fact, after Coach K’s Duke powerhouse – a 3 seed — got clocked in the first round by Mercer – a lowly 14 seed — USA Today is reporting that Jabari Parker is now “unsure” of the NBA draft. For years now, the NBA and the college game have struggled with the growing problem of student-athletes leaving school early to go pro. 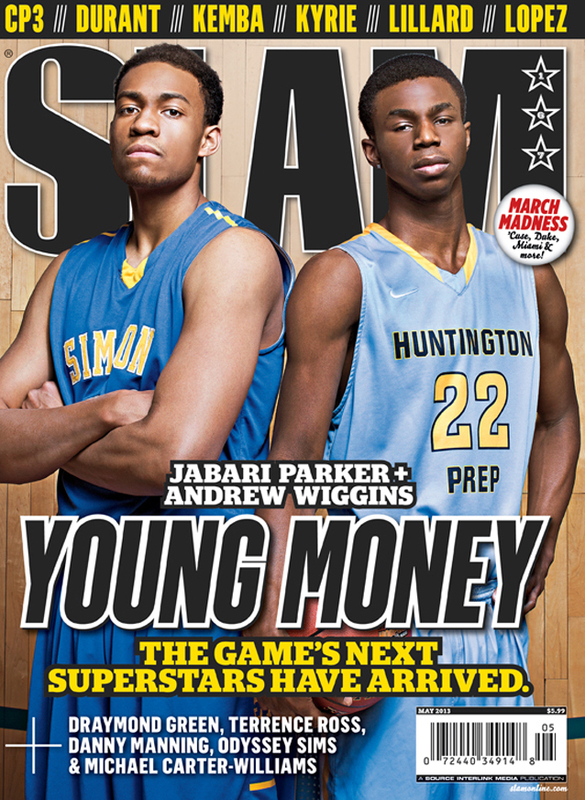 Largely it’s a problem of the NBA and NCAA’s own making. But that problem may finally be getting solved in the best possible way: on the basketball court. 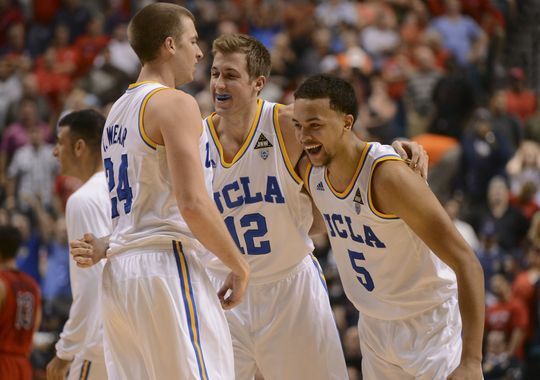 I’ll be rooting for UCLA – whose starting five include two seniors (Travis and David Wear), one junior (Norman Powell), two sophomores (Jordan Adams and Kyle Anderson) – and not one freshman one-and-done! If that makes me a grumpy old man, so be it.